Today was one of the scariest and most mortifying moments of my motherhood journey thus far. I can laugh about it now....kind of. But at the time, I was definitely NOT laughing. We are in the market for a new carseat. Laney has outgrown her carrier and needs to be moved, so I've been pricing a few (those things are EXPENSIVE - whew!) and checking out different options. I decided that today was the day we were going to buy her new seat. We went to Buy Buy Baby and I was all ready to check out their seats and possibly even make a purchase. 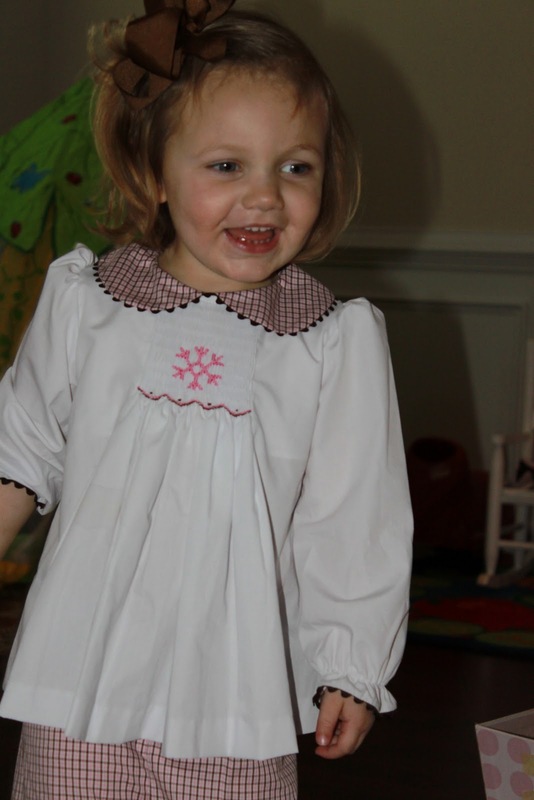 Of course, as soon as we walk in the door there is a line of cozy coupes just beckoning poor Libbi. Such torture! After a few minutes of looking at seats, we needed to take a bathroom break. Always a fun time with both girls. :) We made the trek to the back of the store, unloaded our buggy, and left it out in the hallway. After we finished our business, we came back out to retrieve our buggy. Libbi was standing right beside me as I lifted Laney's carrier up to put into the seat. By the time I placed her in the front, Libbi was gone. Just like that. Y'all, it was all of two seconds. And she was gone. To be honest, I wasn't too worried at first. We were in the back of the store near all of the nursery displays. There were cribs, rocking chairs, gliders, etc and I was just sure that she was either a) in a crib or b) in a rocking chair. I calmly looked around the general vicinity of the restrooms and called her name. I fully expected her to say, "Here me ham!" as she often does. I started to call her name a little louder and walk a little faster. At this point, I started panicking. I was scanning every last inch of the back of the store and trying to keep from hysterically screaming her name. I decide to start walking towards the front of the store, because I'm going to have to seek help. I am so mad at myself, but also more scared then I've ever been in my life. I'm praying and trying my best to remain as calm as possible. About halfway to the front of the store, I stop dead in my tracks as I see Libbi coming towards me. She is smiling like she's having the time of her life. 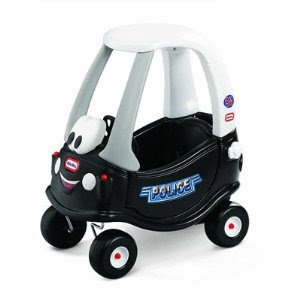 And she's riding down the aisle in a police car cozy coupe. I didn't know whether to laugh or cry or slash the tires of the cozy coupe. I was so busy feeling relieved and thankful that she was okay that it took me a minute to realize the manager of the store was also standing there. He says to me, and I quote, "you might want to watch her. She's been riding this thing all over the store and has knocked over a couple of displays and run into quite a few things." Since I usually encourage my 2 year old to wander stores without me and test out the merchandise. Y'all, I'm telling you, at this point I was beyond mortified. I grabbed Libbi out of that car, plopped her in the buggy and apologized profusely over the sound of Libbi screaming, "LET ME OUTTA HERE!!!!! I NEED TO DRIVE MY CAR!!!!!!" The manager of the store then asks me, "Do you need some help with a carseat?" I pushed my screaming child and poor Laney out of that store as fast as I possibly could. When we got to the car, I tried to explain to Libbi how important it was that she stay with me at all times. That she can never run off like that again. I was crying a little as I told her how scared it had made me. She starts crying (or pretending to, really) and I said, "what's wrong? why are you crying?" She says, "I so scared!" I'm thinking I must have really gotten through to her and she has realized the gravity of the situation. score! I ask her why she's scared and she says, "I so scared 'cuz I choked in the store." (and she adds in a little cough for dramatic effect).